The Karen national flag flown in front of a primary school in the dual administration areas of Win Ye Township was taken down by Burma Army soldiers operating in the areas. Local KNU officials confirmed to Karen News that the incident took place on November 11, at Konekhaing (Koekaw) village in Win Ye Township in the Karen National Union’s Doo Pla Ya district. The Burma army soldiers said that they removed the flag for security reasons ahead of the Regional Commander’s field trip to the area. A local KNU official from Win Ye Township, who asked not to be named, spoke to Karen News on November 21 and said that seven soldiers from the 31 Light Infantry Battalion came to the village and took down the Karen flag. The KNU official said that taking down the flag was inappropriate and they had reported the incident to KNU district and brigade offices. The official also noted that government troops are now more active in the Win Ye Township area. Villagers claimed the government soldiers not only took down the Karen flag, but also removed a signboard at the school. The Konekhaing village primary school was built with funding from a Non-Government Organization and both curriculums of the KNU’s Karen EducationDepartment (KED) and Government Education Ministry are taught in the school. Saw Eh Ka Sauk said the action of the Burma army soldiers showed their attitude towards the ethnic nationalities. 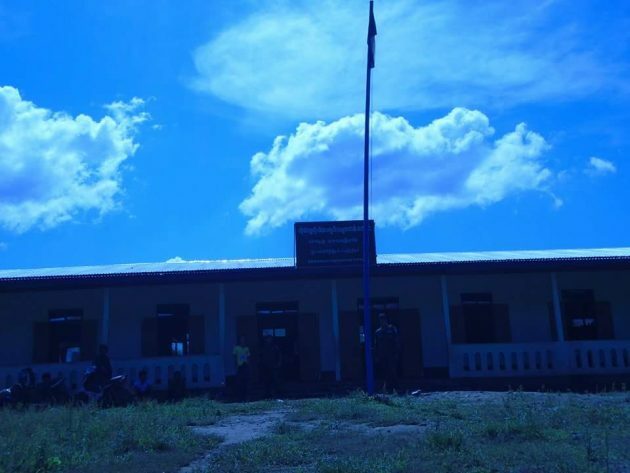 This is the first time since the ceasefire agreement that the Karen national flag that flies at every school in mixed controlled areas have been taken down by the Burma army. Karen News was unable to contact the local Burma Army officer for their response, but according to the latest information from local villagers, the Burma Army unit responsible for the flag’s removal have since apologized for their soldier’s action and explained that they did it out of ignorance.